Image Shows the PMHO2743 with Optional RJ45 Data Couplers and VGA Connector. Presenting an open and shut case for good business: The next generation of flexible desktop and data solutions for multi-media conference room settings. This retractable PMHO2 modules are designed with one touch double doors that function as cable management portals that close while in use. Constructed out of clear anodized aluminum, they are scalable to meet the varying power, data, and audio / visual requirements. The PMHO2 Power / Data Module is a one touch, retractable, scalable power or data center in clear anodized aluminum. The beauty of this power and data cable management unit is unmatched. The PMHO2 can be closed during use to conceal all connectors and plugs - without any disruption of work. While closed, viewers experience the professional clear anodized aluminum finish of the data / power unit. One touch, and the fluid double door opens or closes with ease. The PMHO2 Module is a great addition for any executive office or conference table to achieve the best in data / power cable management. 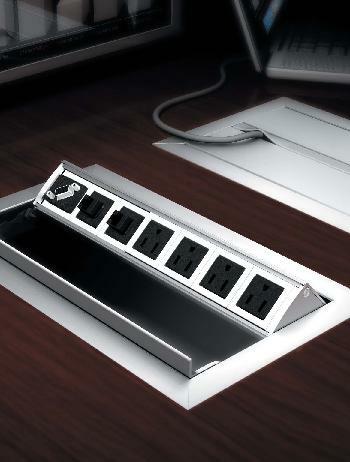 The open technology ports on this unit can be filled with optional connectors and cables. As you look to customize this Power / Technology Module, click the links below for the specifications and prices on the optional voice, data, USB, audio, and video components / cables. Not quite what you need? We can customize this to meet your requirements Call us at 877-878-8770.